Outreach | Amie Maciszewski, Ph.D.
Amie’s outreach events raise awareness and appreciation among youth and adults by providing them the opportunity to experience the performing arts of India through participation in the creative process. She offers interactive workshops as well as a variety of specific performers that are meant to engage audiences with new ideas and experiences through music. 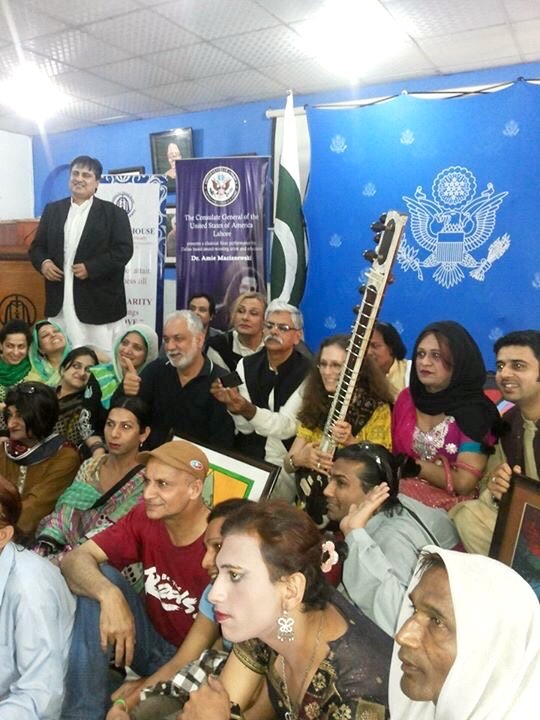 These learning opportunities not only will increase understanding and appreciation of the traditions and raise confidence among school students (some of them from underserved communities) but also will facilitate new kinds of collaborations between educators and performers and provide employment for local performers. Completion of these and other innovative, culturally diverse activities will help schools to secure more funding and attract more talented students. Providing youth of various cultural and socioeconomic backgrounds and abilities with inspiring, accessible exposure to South Asian culture will facilitate positive understanding and communication between people of diverse communities and those of South Asian descent. 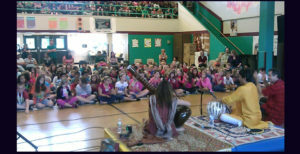 The programs outlined above will provide outreach in the schools and help build audiences by introducing the music of India to students and their parents. They will also provide materials to teachers that will importantly augment their multicultural music curricula and, by extension, their appreciation of the art form. Some of the unique programs she offers are described below. 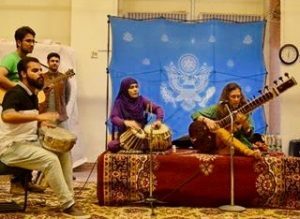 Featuring Amie on sitar and vocals accompanied by a tabla player, the artists will present a performance on sitar, tabla, and voice. 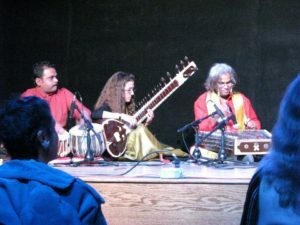 Students are introduced to the basics of North Indian raga (melody) and tala (rhythm) and will be led through vocalization and clapping exercises. Suitable For: All ages, including special ed. We present a slide show of Ragamala Indian miniature paintings and discuss the relationship between various Hindustani music melodic types (raga), moods (rasa), and colors (rang). 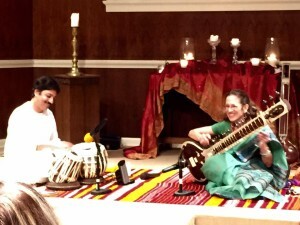 Amie subsequently performs several of the depicted ragas on sitar and voice, accompanied by a tabla player. Suitable For: Upper elementary, middle, and secondary school; post-secondary and community education. Instrumental and vocal classes taught to choir and instrumental music students by Amie with tabla accompaniment and explanation about rhythm. Note: Instrumental students will learn Indian music on their respective instruments. They will not be required to learn sitar. Following the residency, each group of students who participated will perform a short piece they learned during the residency! This performance is free and open to the public. Duration: One or two weeks, Monday – Friday; 1.25 hr./per day with vocal students; 1.25 hr/day with instrumental students. A presentation of music and dance celebrating India’s Holi (spring and colors festival) featuring Amie with one or two musicians and a dancer. 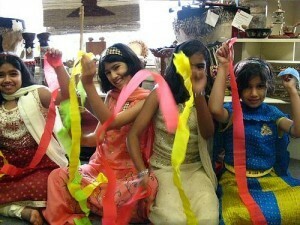 Students will be invited to “play Holi” with colored streamers. 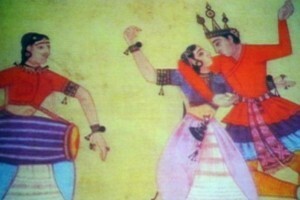 A presentation of music and dance celebrating the rainy season in India, considered the most poetic time of year, featuring Amie with one or two musicians and a dancer. The musical selections have the theme of rain/monsoon. The god Krishna is most often the protagonist in literature depicting this season. A presentation of music and dance celebrating Diwali, India’s fall harvest celebration, featuring Amie with one or two musicians and a dancer. During this festival, it is believed that Lakshmi, the goddess of the home and hearth, comes to bless all the homes (and hearts) in which a light is burning in order that the coming year will bring prosperity. Students will decorate the performance space with candles and strings of colored electric lights. The workshops will provide opportunities for students and educators to interactively experience the music and dance forms and their creative process, along with relevant cultural information presented appropriately to the age group. The festivals, in addition to the above, will provide contextual application of this information in the re-enactment of cultural events in which music and dance play an important role. Dr. Maciszewski will provide the teachers with a list of terms and facts about the music and its cultural context, which they will go over with the students following the workshops. Teachers will have the option of assigning the students to write short essays (appropriate to their respective grade levels) about their perceptions of the workshop they attended. The residency will provide students with an intensive, musically innovative experience sustained over two weeks, after which they will perform a piece Maciszewski has taught them in the residency (traditional musical material played on non-traditional instruments—that itself an innovation) at a school concert open to the public, which some of them can be involved in organizing. Evaluation forms can be handed out to the students at the completion of each workshop and residency. The school residency culminating in a free performance open to the public will positively challenge students to work towards a goal that consists of several aspects. These are 1) performance of a piece of music that is unfamiliar both in terms of content and cultural context; 2) involvement in the promotion of the event to their peers, teachers, and parents in the community; and 3) working under the guidance of the resident artists and school teachers to present contextual information to the audience in the form of a program book and informative emcee-ing during the performance. This is expected to draw an audience from among communities who would be less likely to attend the ticketed concerts. The seasonal festivals will promote this type of cultural activity in an innovative setting—the public schools, thus serving youth, underserved, and special needs populations. As a selected artist on the Texas Commission on the Arts (TCA) Touring Roster, Amie offers a variety of programs for educational and public institutions, as well as diverse community centers. The Texas Commission on the Arts (TCA) provides grants to help with the costs of bringing in companies and artists from this roster for performances. Nonprofit organizations, schools, colleges, and units of government in Texas and the region may apply for Arts Respond Performance Support with the TCA. Arts Respond Performance Support is the companion grant program that allows performing arts presenters in Texas to apply for a portion of the artistic fees to book Amie and her ensemble for a performance, workshop, and/or residency. This is a quarterly program that can provide a grant to help with these costs. These applications must be submitted in advance of the performance and by the appropriate quarterly deadline.